Team celebrates in clubhouse after sweeping Yankees and joins fans for downtown parade and celebration on Fountain Square. CINCINNATI – Forlorn Reds fans have to be jealous of their friends and family who root for the Dodgers and Red Sox. They're playing in the World Series, while the Reds are still taking their lumps from their fourth-straight last-place finish. So it's time to do what Reds fans always do when they're down in the dumps – take a wistful look back at the Big Red Machine. Ancient history? Well, yes, it's been 42 years since the Reds swept the Yankees to win their second straight World Series championship. WATCH the video above to see players and fans celebrate, capped off by a downtown parade and rally on Fountain Square. A year after beating the Red Sox by the skin of their teeth in seven games, the Reds went undefeated - 7-0 - in the 1976 postseason, sweeping the Phillies in three games to win the National League pennant. When WCPO's Walt Maher asked manager Sparky Anderson if the Reds had embarrassed the pompous Yankees, Sparky was too gracious to rub it in. "I don't like to try to think we embarrassed them, I just hoped we'd give them a good old-fashioned beating," he said. 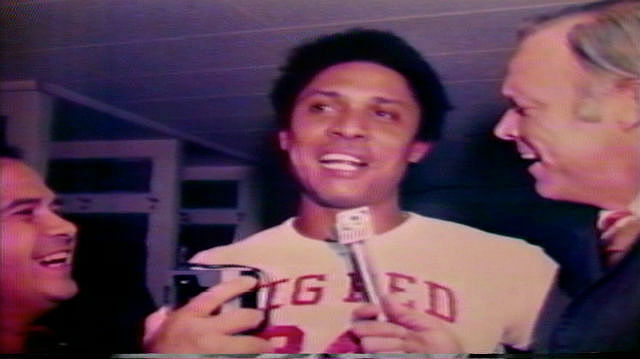 WCPO's Walt Maher (right) interviews Tony Perez in the Reds' clubhouse after World Series sweep in 1976. Hall of Famer-to-be Johnny Bench had the worst season of his career, but he made up for it in the World Series. He hit .533 (8-for-15) with six RBI. He also homered twice in Game 4 at Yankee Stadium and won MVP. Bench called the turnaround "the biggest thrill of my life." "I enjoyed it very much as a team man last year," he told Maher after Game 4 in New York, "but maybe it's selfish or whatever it is, this is my greatest thrill." 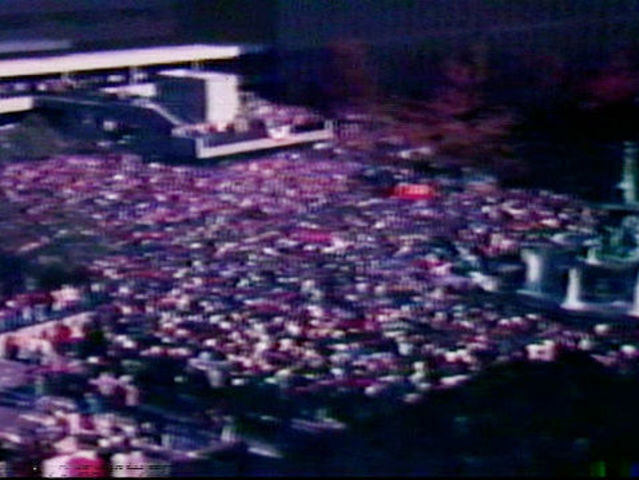 Thousands of fans flooded Downtown the next day for a victory parade and a rally. They crammed into Fountain Square to cheer the team, hear the players speak and see them hoist another World Championship trophy. Bench, Pete Rose and Anderson all vowed to be back in 1977. 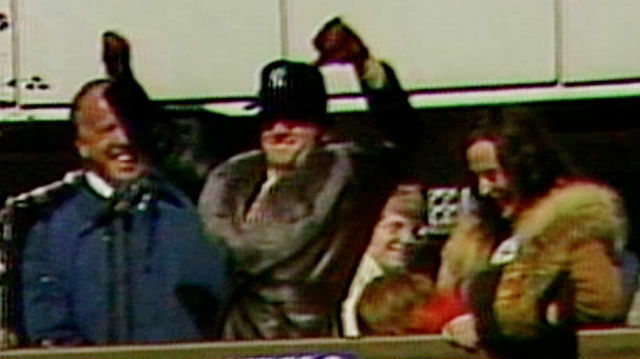 Wearing a Yankees cap, Pete Rose gives thumbs-down to the Reds' World Series foes during the rally on Fountain Square. The free agency era started that offseason, and the Reds lost their best pitcher, Don Gullett, to the Yankees. They traded for Tom Seaver in midseason, but by then the Dodgers had a seven-game lead, and the Reds couldn't catch up. They finished 10 games out. The biggest loss was Tony Perez. The Reds traded Mr. Clutch to make room for an up-and-coming Dan Driessen. The holdovers said losing the future Hall of Famer and his clubhouse influence cost them a chance to three-peat. In 1978, the Reds finished second to the Dodgers by 2 ½ games, and the Big Red Machine era was over for all practical purposes. Sparky was fired in the offseason. Rose signed with the Phillies. The Reds were still a team to be reckoned with in 1979, with Bench, Seaver, Joe Morgan and George Foster. They even won the West Division under John McNamara. But the Pirates swept them in three games and the Reds didn't get back to the playoffs until 1990, when a whole new Reds team magically won another World Series. But it's 28 years later and we're still waiting for the next one.